Update: I realized I was wrong. Okay, for many of you, this will seem silly and inconsequential; others will find it blasphemous. But bear with me for this quick post. Starting in a few weeks, I’ll be teaching a survey of the Bible class through the summer at my church (I’m going to try and record it and post it here each week). To prep for this, I’ve been delving back into seminary-land, reading about 12 different OT Surveys, OT intros, and Pentateuchal commentaries to get ready for just the Intro to the Old Testament and Pentateuch parts. And of course, this brings up the issue of the authorship of the Old Testament. Honestly, I don’t plan on going more than 2 minutes on the topic in this class, but I want that two minutes to be fair, informed, helpful, and above all, edifying to the people in the room. I want people walking away understanding that godly people disagree on this stuff and why they do. I don’t want to caricature and criticize unnecessarily. The main issue I’m working through is what part Moses (or any other pre-10,000 B.C. ancient authors/editors/redactors) had in writing the Pentateuch. In college I took an OTI (Old Testament Introduction) class from an extremely godly man and equally able scholar. 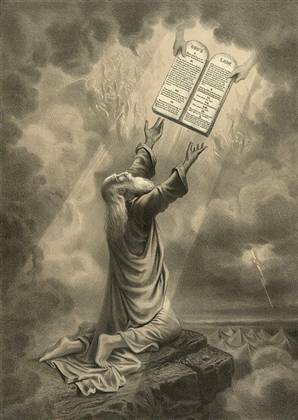 He presented the scholarly consensus about OT authorship, which is something called the Documentary Hypothesis (where the OT is more or less different documents written by different people at different times–all much later than Moses–and then stitched together at later times. In other words, someone like a “Moses” had little or no part in actually writing the Pentateuch). At the time, of course, this pushed up against the assumptions of my fundamentalist upbringing. I wrote off this man’s lectures too quickly and too easily. Thinking back on it, even now I’m shocked of the quality of lectures I was getting and simply did not engage in. I regret that. As time went by, I hung out with some great people and read some great books, and my sentiments changed greatly. I assumed the Documentary Hypothesis was more or less correct, and that’s what God used to write his still-inspired, still-authoritative Word. But now, in preparation for this course, I find myself reading some more conservative voices (especially this amazing OTI by Archer Gleason) that are successfully dismantling the assumptions of the Documentary Hypothesis. So… I don’t know. I don’t think there’s an absolute theological or gospel necessity for Mosaic authorship (though I personally think there is at least a Mosaic “core” there), but the Documentary Hypothesis seems to be inadequate on its own. So I want to hear from some of my more learned friends and crowd-source this question. What do you think? Is there a “third-way” with this? What’s a sensitive and pastoral way to consider this and communicate this to others? ← Today, a new chapter begins at the Birdhouse. I had one prof. articulate it in this helpful way. Just as scholars often talk about a J, E, D, P document, the completed, redacted Pentateuch probably as an “M” document (Moses document) at its core. So, what we have is not Moses’ handwriting, but the Pentateuch. Nevertheless, the Pentateuch is Mosaic at its core. Perhaps it’s like saying that Jesus preached the Sermon on the Mount and yet, never wrote a word of what we have in Matthew’s Gospel. In response to padhikari, I have to say that the idea of the DH being passe is an evangelical fiction. The hypothesis is nuanced and developed, but also assumed throughout the Biblical Studies/ OT guild. Yes, there is a final literary product, but there are also pieces that have been fairly obviously stitched together. Then there are the issues of clear post-exilic redaction. I worry about dismantling “assumptions” of the DH–this is often a way around dealing with the data in front of us. I have two types of responses here, one to piggy-back on Daniel and another to address your desire to edify in this process (something scholars often don’t consider unfortunately). First, I think evangelicals too often create a straw man in the dismantling of the DH. They take older models, dismantle them, and think that equates to evidence for the traditional evangelical hypotheses of authorship. But the model has evolved greatly since Wellhausen and is actually much stronger now than before. So, sure the idea that there are 4 primary redactors (JEDP) for all the OT might be passe, but the idea that the OT is a highly redacted document and a product largely of exilic or post-exilic hands is pretty much not debated at this point (as far as I know, I could be wrong). But secondly, the most edifying way I have found to address this to my college students and the folks in my Sunday school class is to tie it to a God who speaks to us in ways we understand, to make sure I overemphasize by belief that the Bible we have is the Bible God wants us to have (regardless of how uncomfortable that might make us), and to help them see the Bible as Israel’s book, or as Daniel so eloquently put it, that the Bible is both to us and not to us. Hope this helps, let me know how the class goes! I’d also echo what the good Dr. Kirk has offered. The idea of “dismantling” or “debunking” the DH are, I think, a bit of an overstatement, if not a complete fabrication. Some of the most exciting work being done right now in Hebrew Bible (at least to me) is being done by scholars like Jeffrey Stackert at UChicago and Joel Baden at Yale Div who are doing some amazing work based on DH. Not only them, but Mark Smith of NYU has relatively recently written a great book on P’s theology as expressed in Genesis 1. I’d suggest reading Ernest Nicholson’s “The Pentateuch in the Twentieth Century: The Legacy of Julius Wellhausen.” It shows how the original form of DH has been adopted and adapted by many since Wellhausen, yet it still is persuasive. All that to say, the idea that DH has been debunked or found wanting holds just as much water as reading an article on answersingenesis.org saying that evolution has been shown to be false. Thanks for inviting discussion, Paul. It is my understanding that there is a strong consensus among modern scholarship formed around the DH and has been one for decades. It’s not difficult to find out why, as it becomes quite clear when you read the texts in original Hebrew. Like a commenter above me stated, I also am suspicious of someone claiming to have “dismantled the assumptions of the DH.” A true, didactically structured study of the Pentateuch points overwhelmingly to the validity of the DH, and it is not something that can be “dismantled” so easily. Among the many examples of Biblical imperfection that could be cited, the basic premise that countless historians and hermeneutic scholars have put forth is clear: the Bible is a composite of multiple sources that did not always agree with each other. Of this, there is no clearer example than the DH. Two centuries of detailed study have revealed the way in which the Bible was put together. In its original Hebrew, the Pentateuch shows unmistakable signs of different authors writing different parts, and then someone later patching the separate parts together. “The most obvious signs of different authorship are their choices of certain phrases and words, especially the word they use for god. One source is known as the “J” source, after Jahveh, a common name for god. This name was mispronounced and misspelled as “Jehovah” by later authors. The authors of the “J” document were priests of the southern kingdom of Judah, who wrote between 848 BC and the Assyrian destruction of Israel in 722 BC. They use terms such as “Sinai,” “Canaanites”, and several others unique to this document. “The second main source is known as the “E” document, after their name for god, Elohim, “powerful ones” in Hebrew. The priests who composed the “E” document were interested in different issues, used a different set of phrases, and can be traced to the northern kingdom of Israel, sometime between 922 BC and the Assyrian conquest in 722 BC. The E authors use such terms as “Horeb” instead of Sinai, “Amorites” instead of Canaanites, etc. Moses is the central focus of this document. “A third source, the “P” source, or Priestly Code, was apparently written by Aaronid priests around the time of the Babylonian captivity in 587 BC. Thus it is the youngest of the sources of the OT. The P source emphasizes the role of Aaron and diminishes the role of Moses. The document is characterized by long lists and boring interruptions to the narrative. To Hebrew scholars, the “P” source is also distinctive in its low, clumsy, inelegant literary style. These are only small excerpts from the book, but there is a lot more meat on that bone. Thus the common belief that Moses was divinely dictated the Torah on Mt. Sinai is seriously brought into question upon a critical or scholarly analysis of these disparate texts in their original linguistic context. All of the problems posed found within the Biblical canon of course make perfect sense given exclusively anthropomorphic ascriptions of holy texts and other supernaturalist writings. But perhaps this leads into a separate discussion for another time. If the point of your post was to see if others think the DH has become decreasingly credible in recent years, that answer seems to be a resounding ‘no.’ If instead you are soliciting opinion on what this means for the believer if the DH is in fact true, then I will humbly bow out. I don’t think the Bible was divinely inspired or “god-breathed”, just as I don’t ascribe countless other mythological works preceding it to the supernatural. To me the Bible is a canonical text, written by ANE humans. It’s no more existentially significant than the Quran or other religiously sacred texts throughout human history. Looks like my earlier comment got lost…. The gist was that I agree with Daniel, Jared, and Art (with thanks to Joe), and now I see Daniel has added some information. The death of source criticism is a misleading apologetic by Evangelicals and would not last very long in broader academic conversations. No one is where Wellhausen was, but the notion of oral and written sources brought together at various stages and concluded in the postexilic period is not based on poor theological prolegomena and does not maintain currency because of stubborn unbelief. It remains because it is a compelling paradigm. There is also no mass confusion in Pentateuchal studies, as we keep hearing. There are various approaches to SC, and they debate each other. But the existence of such plurality does not mean mosaic authorship is now vindicated, which is how the Evangelical discussion usually goes. Paul, I was intrigued when your link appeared in my Facebook news feed. To put it all in perspective, in my own doctoral work at a non-Evangelical institution, I learned very quickly that OT scholars who subscribe (fairly closely) to Wellhausen’s theory are in fact the conservatives in the world of mainstream biblical scholarship. Evangelical scholars are often right that the Documentary Hypothesis has come under fire lately, and that nobody believes in JEDP exactly as Wellhausen articulated it. But what this apologetic move doesn’t tell you is that JEDP is usually replaced by a much more radical pessimism toward dating the Pentateuch before the exile. Example (1) Source critics are alive and well, and many of these will refuse to make any historical claims about the Pentateuch’s composition before the Hellenistic period (i.e., really late). Nowadays if you claim that you believe there was a J-Source that was composed during the united monarchy, the answer you may well receive at a place like SBL would go something like: “You believe there was a united monarchy? How quaint.” Example (2) We have the literary and post-modern readers of the Bible. A very good many of these are perfectly happy to work under the assumption that the Pentateuch was cut out of whole cloth, like a modern novel, perhaps as late as the Maccabean period. So at this point many Evangelicals or Post-Evangelicals are all too happy to cling to Wellhausen, because at least then you still have something to say about pre-exilic Israel. This is not to say that the scholars who fall into camps (1) or (2) are necessarily in the majority, but it does throw the academic conversation into a radically different light (or so I perceive it). Hey brother. I love seeing this discussion appear on the internet as it deals with a question I’ve been working through as well. Thanks particularly to those above me who have offered book suggestions on surveys and history. I wish many times that we could have an authoritative look at how the different threads of tradition wound their way into our Old Testament. Did they all find equal representation during the history of Israel, or is the amalgamation we see more reconstruction than construction? For a survey course, as some indicated above I’d stress the primacy of Scripture and the sovereignty of God working through it. The method of composition can be challenging for many, but trusting it as a window to a counter-imagination of culture and reality is the real crux. I wish I could sit in and hear you teach! I’m truly far out of my league to weigh in on this conversation, and I’m also a good 3 weeks late. But my 1 or 2 cents is simply to note that one of the underlying assumptions of many scholars who espouse the documentary hypothesis (or whatever the updated version is) is an incredulity toward the miraculous or toward fulfilled prophecy. In other words, the scholar may desire to fulfill or justify certain presuppositions, which tends to create a bias in his or her scholarship, which leads to advocating for certain conclusions while other possibilities are thrown out not primarily because of the evidence that is compiled but because of the underlying unbelief in miracles. I guess the impact of our presuppositions and our inability to weigh evidence objectively could be said about all scholars, but either way, I thought it was worth pointing out. Like I said, take that for what it’s worth. I’ve done minimal reading and only taken 1 OT class that covered these topics. Chris: The same could be said from the other side of the aisle: Evangelical scholars presuppose the miraculous, therefore all of their scholarship is not objective and weighed according to the evidence, but is simply an exercise to reaffirm their prior commitments. They end up advocating their conclusions not because of the weight of the evidence before them, but because of their underlying belief in the miraculous. We could play the Van Til game all day, but it never ends up getting anywhere. I’d suggest doing some more reading this area of scholarship. It’s amazing how a bit of research can drastically change one’s opinions. Hey art, yea, I did mention in my post that the same could be said of all scholars, so I’m aware that it’s a fairly universal observation. Though I still think it’s worth pointing out, for this reason: I guess from my perspective (and again, I admit that I’m severely under-read on these topics) it seems like liberal scholars searched for the evidence to validate their unbelief in the miraculous, as opposed to discovering evidence and then fitting it into their beliefs. In other words, it appears that in this scenario, the presupposition almost entirely drove the pursuit for supporting evidence, rather than finding or discovering evidence and then weighing it and deciding what it means in light of previously held beliefs. Which is why the traditional documentary theory dealt with 4 “sources” that have no historical basis or evidence for their existence. What I mean is, instead of actually finding the J source and then concluding that the documentary hypothesis is correct, scholars have assumed that the text is wrong, and then have sought for ways to discredit the text and for an alternative hypothesis. This seems to be a bit backwards. But I admit, I need to do more reading, and I will no doubt dive into this topic in seminary, which I hope to attend next year. What are the main texts I should read for this realm of study? Any suggestions? Are you sure that isn’t an assumption Chris? Chris: to say that “liberal” (whatever that means…it usually just means anyone to the “left” of the person speaking) scholars simply assumed that the text is wrong and were then driven to JEDP is not only a misunderstanding of the origins and basis of the idea, but also it reads motivations into people’s thoughts and actions, which I think is not only unfair, but also uncharitable. I would say, rather, that you have it backwards in the way that you understand how scholars have come to some form of the DH. Again, this entire thing could be flipped: one could say that Evangelical scholars simply choose to believe in the supernatural and in Mosaic authorship and have been driven to their conclusions on the basis of their commitments, not on the basis of evidence. Again, I don’t find Van Til helpful, here or otherwise. I’d suggest reading Wellhausen himself and then look into Jeffery Stackert’s work, along with Mark Smith’s book on P’s creation narrative and Nicholson’s book I mentioned above. Yea, I’ve actually been taught that by my profs in college, which is why I mention it. My profs made it seem like the bias against the supernatural drove a large part of the (maybe the initial?) pursuit of the JEPD theory. They said something along the lines of this: since some scholars didn’t believe in prophecy etc., they desired to find a way to make sense of the pentateuch, and came up with the documentary hypothesis. I knew the word liberal was a poor choice but I didn’t know how else to quickly identify who I was talking about :p But regardless, I know that I am under-read on this topic, and so I will defer to your own opinions since you seem to know a lot more than me! I definitely do not understand the intricacies of what is going on; I just wanted to throw in my 2 cents. I also haven’t read any Van Til, I’m simply sharing a few of the things that I’ve been taught by my profs at college. So I’m not trying to impose any foreign system into this discussion, I’m just sharing my own thoughts and how I see it at this point. Hey guys, I’m glad this post is still generating some thought. Chris, I’m sorry we haven’t gotten to meet yet. I have seen you around, I’ll certainly say hello soon. Anyway, the professors from whom I have learned about the DH, every commenter on this thread that agrees with the DH (except for Daniel above), and the main books/commentaries I’ve read in support of the DH are ALL Resurrection-believing, committed Christians with real and deep faith. I also believe that Welhausen (the guy that came up with the DH) was also a Christian (Lutheran, I think? Maybe). Having grown up in the Bible-belt, I understand these concerns, but I don’t really think they’re necessary. And also, one phrase that keeps being thrown around in this that isn’t helpful is whether or not people believe the Bible is “true”. The truth of the Bible is more than it’s connection to history or science. The original writers of Genesis were not (in my opinion) writing science or history (and they knew that), but if you asked any of them, they would have absolutely said that their words were “true”. “Truth” in the modern, western sense is usually an empiricist truth, which is only “true” in so much as it exists in created reality that we can measure, test, and experiment upon. Christian truth, however, exists in Ultimate Reality, that is, God himself. So, things can be “true” even if they don’t have any relation to history or science. And so, believing in the DH has nothing to do with whether or not you “believe” the Bible or “believe” in supernaturality. It’s just a belief about how the Bible came to be, through the people God had chosen, in the culture in which he did. It’s not an existential statement about divine prerogative. I’m in the process right now of posting my first talk of my Bible Survey class I started this past week at liberti, and it goes into some of this stuff. It’s hopefully a clear and worshipful articulation of these things in a way that is edifying to believers rather than frustrating. So, check that out. As far as books go, I’d go with whatever Art suggests if you want more scholarly items. But I’d also suggest the books of Pete Enns, who commented above, as a really great and casual intro to this stuff. Paul, thanks for chiming in 🙂 Unfortunately the interns are going to Delaware this weekend so I won’t be at Center City this coming Sunday. But we’ll connect at some point!